Iraqi forces, bolstered by the international coalition, are making significant gains toward defeating the Islamic State of Iraq and the Levant in Mosul, Defense Secretary Ash Carter said today. "I'm encouraged by Iraq's determination in the face of the difficult fight," Carter said. "I'm confident that ISIL's days in Mosul are numbered." The defense chief spoke at the start of a meeting with French Defense Minister Jean-Yves Le Drian, at the Daughters of the American Revolution Constitution Hall, a National Historic Landmark building. Topics of the bilateral meeting, he said, include the global fight against terrorism, as well as enhancing the already strong U.S.-French military alliance. Also on the agenda was the signing of a joint statement of intent that provides the framework for enhancing U.S.-French defense cooperation more broadly, he said. The two were also discussing expanding cooperation in cyber and space, and signing an arrangement for military space cooperation, Carter said. "These steps combined serve testament to our longstanding partnership," he said. 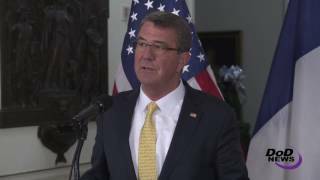 Carter applauded the French contributions in the fight against ISIL. "I'd like to thank France especially for its strong military contributions to the campaign, including once again extending the tour of the aircraft carrier Charles de Gaulle," Carter said. "In Mosul, Iraqi Security Forces with the help of the United States and France and the rest of our global coalition are nearing the isolation of the city and they continue their deliberate advance into the city," he said. Carter said he, Le Drian and other coalition members developed a plan last year with their Iraqi partners. That effort, according to Carter, is progressing according to plan. The battle for Mosul began in mid-October. In Syria, local forces supported by the coalition began a push earlier this month to take back the city of Raqqa. Those forces are making notable progress, Carter remarked. "Meanwhile in Syria, our local partners are now just 20 kilometers from Raqqa, as isolation of ISIL's so-called capital continues," he said. "The reality is that ISIL finds itself under pressure on all fronts simultaneously -- and that's exactly what we planned for, as we discuss next steps today in our effort to deliver ISIL the lasting defeat it deserves," Carter said. This month marked the anniversary of terrorist attacks in France that killed 130 people, Carter noted. They were "barbaric attacks that were more than an assault on France -- they were also assault on our common human dignity," he said. "In the year since, the United States and France have stood resolute together and against terror in Paris, in Iraq, and Syria and elsewhere around the world where we've been called upon," he said. Le Drian thanked Carter for his unwavering support, saying the U.S. defense chief has been by his side ever since January 2015, when the first of the recent terrorist attacks occurred with 12 people killed at the offices of the satirical Charlie Hebdo magazine. "Our relationship was strengthened in adversity," Le Drian said, adding, "I wanted to thank him personally at this very special time."